As I was embarking on the long walk home at 8 o'clock this morning after a huge night out (so much for being busy with work), I thought about simplicity. I watched the the non-hungover public go about their Saturday morning routines — jogging club with old friends, bacon & eggs at a café, walking the dog by the river. It was nice. Why complicate things? A good village salad is crisp, fresh, cool, and bright. It has the salty intensity of feta and olives, and the sharp tang of vinegar but is never harsh and overwhelming. It's great by itself, with some fresh bread, or if you're really keen a slab of tender, slow roasted lamb. This is less of a recipe and more of an ingredient list. 1. Chop the cucumber and tomato into medium-sized chunks. Chop or crumble the feta into 1 cm pieces. 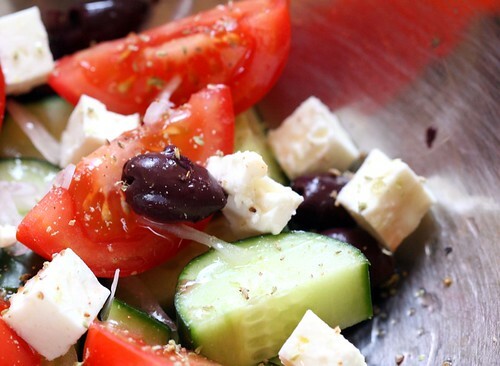 Place the cucumber, tomato, olives, feta, and shallots in a large bowl. 2. Sprinkle with a little pepper and a little oregano. Drizzle with olive oil and vinegar (I use roughly a 3:1 ratio of oil to vinegar). Toss to combine, serve. 1. It should go without saying to use the best ingredients. A ripe tomato, fresh feta, and the best olive oil you can find. 2. This is different from most of the dried oregano you find in supermarkets, it's fragrant and intense. Find it at ethnic delis, it comes as a large bunch, dried whole, stalk and all. To use break of what you need and rub it between your fingers to separate the herb from the twigs. It's been over a month since I last posted, a lifetime in the world of blogging. This is bad. I regret how the site has stagnated and absolutely do not want it to become yet another ghost town of a blog. There are several reasons why things have slowed down (where not moving is just a particularly severe form of moving slowly), and these can be broadly grouped into (a) reasons relating to time pressures; and (b) reasons relating to creativity. One could argue that there exists a third group — (c) reasons relating to my new Xbox — but come on, it's so much fun! Or, Who knew that being a doctor was hard work? My days are long. They start early, finish late, and seem to multiply until I find myself pleasantly surprised that although I might work Sundays I can get home by 1pm. It's not always that bad, but it's unpredictable. While I used to plan my meals a week in advance based on how I can eat fresh and minimise waste, now I'm lucky to make it to the markets once in 3 weeks. When I get home I'm past caring about the right lighting for that perfect shot, I just want cook my meal, and eat it. I still cook, of course. Three weeks ago I made an intimate dinner for a couple of friends who are moving overseas: Spice-rubbed rack of goat, pilau rice, mint & coriander dipping sauce, and aloo gobi. It rocked. I served it hot to my smiling friends, and proceeded to stuff my face in their company while we talked and drank wine. I had three hours that night and chose to spend them enjoying my food rather than colour-balancing it or trying to write the perfect blurb. This doesn't mean that food bloggers don't enjoy their food. What it means is that this particular food blogger loves his food but when pressed, refuses to sacrifice that for pretty pictures and rambly text. Since I'm decrying rambly text I'll keep this part brief: I'm in a rut. Time pressures have limited my access to fresh ingredients and reigned in my inclination to experiment, so I find myself cooking the same type of food day in, day out. When I can knock out a quick carbonara or chana masala with kitchen staples, why risk making something new that could flop and spoil the dinner I'm so desperate for? It's a weak excuse, but when I've spent all afternoon looking forward to a good meal I tend to play it safe. Let's get some things straight. I want to keep posting. I like showing off my recipes, I like having them all in one place — I even check the recipes myself if I haven't made something in a while — and maintaining the site encourages me to be more involved and active in visiting other blogs, which is a good thing. With all of the above in mind, I am making two resolutions. Resolution the first: I will continue to post, even if that means the pictures might not be as pretty, or the blurbs as coherent. Resolution two: I will subscribe to a quality cooking magazine/buy some quality books (recommendations very welcome!) and cook 2 new recipes a week. It's back to school — unfamiliar ingredients and combinations, fastidiously following recipes. I believe in you, Tim!